Today I went to my son’s grave for the first time since I buried him. I don’t know what I was expecting to feel, but I certainly wasn’t prepared for what I experienced. As I stepped out of the car and walked toward the unmarked grave, my heart sank and I was brought back to the day it all happened. I fell to my knees and began to sob as I saw the sippee cup, wreath, and mini Christmas Tree that had been left there for my son. The cemetery was empty except for me and a couple of the grounds keepers who were filling another recent grave plot. I hate it when people see me cry, but today I couldn’t stop myself. While I hadn’t planned on coming back to the grave so soon, this was all I could think of doing this morning when I woke up. Millions of parents hugged their children last night in the wake of the national tragedy in Newtown, CT. Instead of hugging my son, reading him a book, and putting him in his bed, the only thing I could do was wait for sunrise so that I could kneel by his grave and tell him how much I missed him. After some time, I realized that I was shaking from the cold. I picked myself off of the ground, visited the children who were buried next to my boy, and left. For the rest of the day, I tried to avoid the news. It seemed, though, that I could not escape media footage about other dead children. At the gym, nail salon, and just about everywhere I went…I couldn’t get away from it. I wonder what all this trauma in our lives and on television is doing to us as a nation. I don’t want to get used to this. I don’t want to be so destroyed that the death of a child becomes part of normal everyday life. 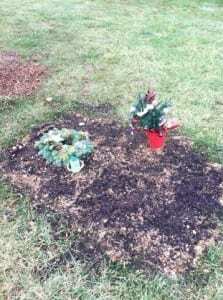 Millions of parents will hug their children tonight, I will go to sleep alone with memories of my son’s unmarked grave. No parent is ever prepared to bury their child, but the way my son’s grave looks is evidence that I was caught by surprise. Until I can afford to place a stone on his grave, it will remain unmarked but covered with symbols of our love for little Prince McLeod. He was taken from me too soon and without warning. My heart breaks for you, for your precious child. I have not lost a child to death, let alone such a cruel death. better, but it is sent with the hope that you will somehow know the sincerity of my words. I just don’t know what to say… Not being able to put a headstone on his grave must add to your grief and despair. I wish I could help in some way, but all I can do is pray. He knows he is loved no matter what his grave looks like. Are you ok? I am sure you aren’t “fine” as I get it. I also know on a different level but grief nonetheless, I had 9 people close to me die within the first 2 years of my daughters life and I wondered how I was getting through it and felt it was a bit too smoothly. When 9/11 occurred, I was pummeled with grief and felt I grieved all deaths at one time. I hope if you are experiencing something like this, you reach out to those who are safe and supportive. I know the holidays alone would be a task to endure this year. I just hope you are ok…….